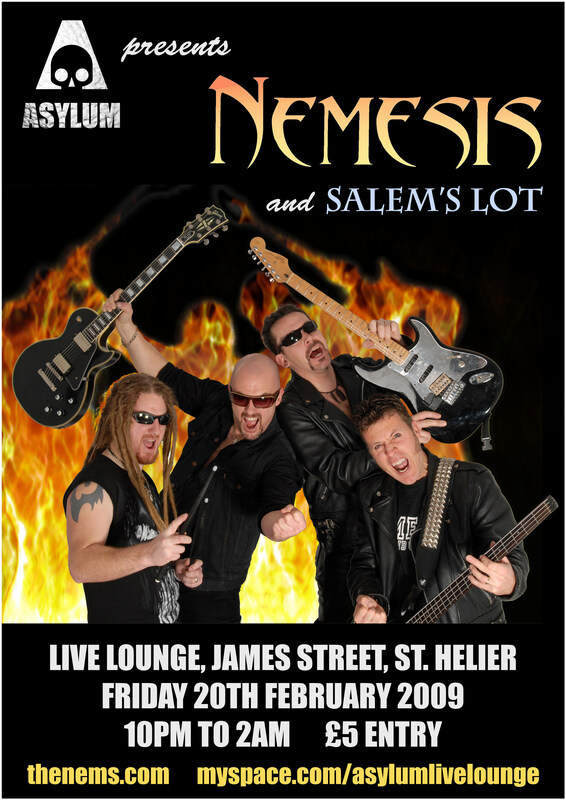 Nemesis are Daz ‘The Colonel’ Carre (drums), Brin Harrison (bass and vocals), Zack Mousetrappe (guitar) and Danny Joyce (vocals and rhythm guitar). In 2007, Guernsey heavy metal deities Nemesis recorded and released a masterpiece of monstrous rhythm, skull-squashing bass, razor-sharp guitar solos and preposterously glorious lyrics: The Hills Are Alive With The Sound Of Metal. That CD was the culmination of twenty years of playing, writing and touring that has seen Nemesis heroically endure while all around fashions and ideologies have come and gone. They began to forge their reputation as Channel Islands’ kings of live and dangerous rock ‘n’ roll in 1987-’88. The lineup at the time was Danny Joyce, Darran James, Brin Harrison and Zack Mousetrappe. They played gigs at the Deep End, sometimes with Jersey’s Street Lethal. In 1989 they recorded the classic EP, Unleash The Beast, which was favourably reviewed in metallists’ bible Kerrang! magazine. By 1990, with Glenn Holmes replacing Mousetrappe on guitar, and the addition of keyboardist Ford, their sound had expanded to include complex rock opera and prog intricacy. Mark Helyar, exponent of Roland GR50 guitar synth, replaced Ford, and Nemesis recorded their album Smile Or Die. Their tour of UK in support of the new release saw a development of light show and pyrotechnic elements in collaboration with Simon Ellis. Guitarists leaving had become something of a recurring theme by 1993, as Glenn left and was replaced by Jem from Street Lethal. They toured the UK again, this time in two vans with a crew of sound and lighting engineers. The tour was a legendary, orgiastic frenzy of music, women, booze and matching suitcases. 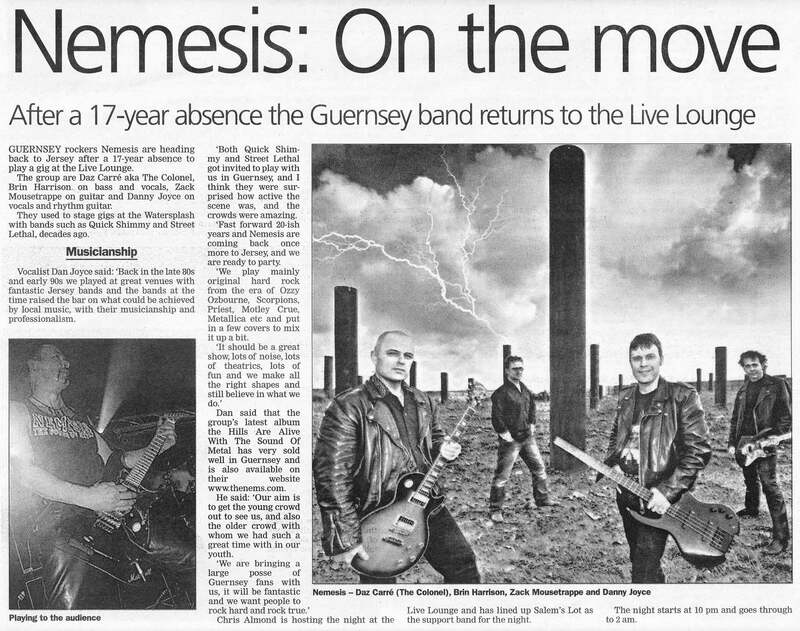 After ten years of other projects the classic Nemesis lineup reformed in 2003 for a sellout show in Guernsey. The fire of heavy rock never goes out, it just sputters occasionally. The fire of Nemesis began to burn all the more fiercely. In 2005 Danny and Zack arrived at Darran’s flat in London with a demo of what would become The Hills Are Alive … The album was made in various studios due to the distances between them, but not spiritual distances – they were as one. It was finally completed after nearly two years of recording and production sessions. The results of those labours are a swaggering heavy metal classic that is without doubt one of the most professional and enjoyable records ever to have come out of the Channel Islands. From Nemesis’ press release: As a bright new year dawns, an enthusiastic and excited Nemesis is joined by 27 year old Daz ‘The Colonel’ Carre on drums, percussion, and explosions. He is an extraordinary talent and adds a hugely powerful, seemingly unstoppable rhythm. Having played in thirteen bands since the age of 13, he has the experience and passion needed to rise to the challenge.When both feet are at full speed attacking the double bass drums he has the intensity of a battalion of Panzer tanks bearing down on you. Support for the night is provided by Jersey rockers Salem’s Lot who are Sam Mezec (vocals and guitar), James Andrews (guitar), Tom Ashcroft (drums) and Nathan Buckfield (bass). Having already played two shows at the Live Lounge this winter, the first with Asylum and the second as part of a collective show with Patrick Star, Nailed To The Furnace, Off Limits, Nocturnum and The Revolt, Salem’s Lot are welcome back for this celebration of heavy rock. They are a very entertaining band with an impressively diverse repertoire of superb original songs, well chosen covers and a dirty glam sound.